This zig zag knitted pattern of this maxi hits me like a wave of nostalgia. I am pretty sure that I owned this exact same dress in elementary school. But it was probably from Limited Too and I most likely wore it with glittery jelly sandals and my bright pink Jansport backpack as a finishing touch. The pattern on this one by Trina Turk makes up for the simplicity in its shape. Long and lean. 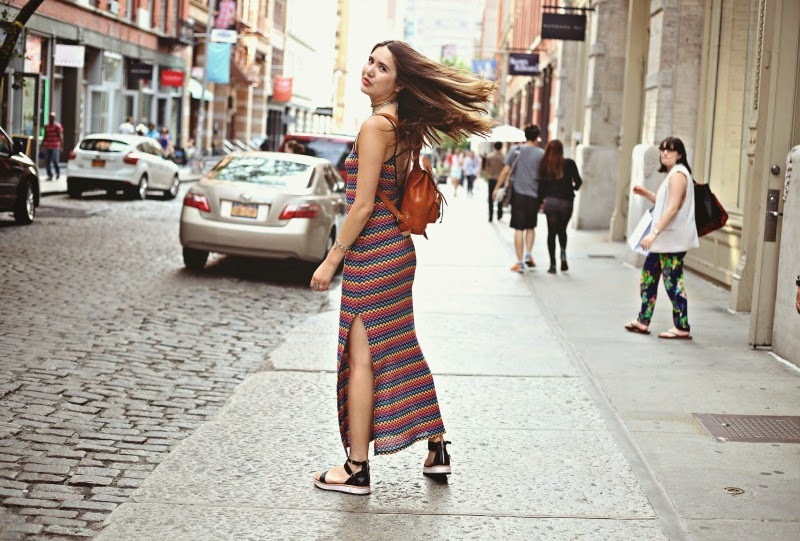 The body conscious maxi dress will forever be my number one summer staple. Keeping the 90's alive with my flatform sandals and calling it a day as I hope that summer never ends. Love those colors. La dolce vita it is. you look so good in whatever you wear cos you are pretty , slim and tall. Love you so much. Love the maxi dress! Totally rocking the rainbow. You look lovely in that dress! I'm in love with your sandals! Looking beautiful! This is such an interesting dress! What a lovely maxi dress! The print is stunning! Oh, wow...it has been such a long time since I've been here! Hope you are well, Dylana! Looking uber cute as always. Love that dress! It definately brings back some memories for me as well, pretty sure I used to own a skirt like that in the 90s...love it! Stunning dress, I love the vibrant zig-zag pattern too. Such a fun look! Looooove it! This maxi dress looks gorgeous on you, love the little bag too!! what a fun dress! the fit is perfect! You look lovely! The dress is super bohemian which is one of my favorite styles. And I'm putting those shoes on my wishlist ASAP! Great look!